Also known as Marietta Tintoretto or la Tintoretta. 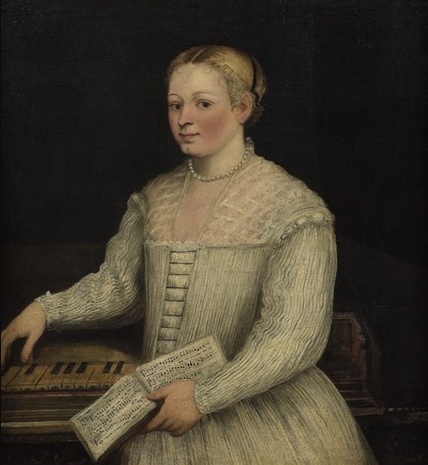 Marietta Robusti (1560? – 1590) Tintoretto’s talented and beloved daughter, learned to paint in her father's studio along with her brother Domenico. Back at a time when respectable Venetian women were expected to stay at home, she used to dress as a boy so she could accompany her father on his various commissions. Her other great passion was music. She specialized as a portraitist, and although both the Emperor Maximilian and King Philip II of Spain offered her a position as court painter, her father refused to let her go because he would miss her too much. When she was 18, her father arranged her marriage to a Venetian jeweller, so she would remain in the city. She continued painting portraits and small paintings, of which only an handful in museums have been attributed to her; the best known one is a self-portrait playing the harpsichord in the Uffizi in Florence, believed to have been painted for her husband. She died of unknown causes and was buried in Madonna dell' Orto.